These cookies are made on All Souls Day. The cookies are a chewy spice cookie for the Catholic Holiday. Come read the story behind All Souls Day. Italian and of course Catholic? What is All Souls Day or All Saints Day? It is a solemn feast in the Roman Catholic Church commemorating all of those who have died and now are in Purgatory, being cleansed of their venial sins and the temporal punishments for the mortal sins that they had confessed and atoning before entering fully into Heaven. The cookie is a spice cookie and chewy. It's really a different taste compared to most cookies we usually make. I love the fall flavors in this cookie and the family loves this unique flavor as well. These cookies have a fascinating story behind them. All Soul's Day, sometimes called the "Day of the Dead," is on November 2 and follows All Saint's Day. All Soul's Day is a Roman Catholic day of remembrance for friends and family who have died. It is celebrated with church services and festivals in honor of the dead. Many customs are associated with All Soul's Day celebrations. Throughout Italy, cafes and pastry shops begin to sell special cookies in late October. Among the many variations of these tasty cookies are these chewy spice cookies from Milan, ossa dei morti ("bones of the dead") cookies flavored with cloves from Sicily, aversion from the Piedmont made with almonds and hazelnuts, and one from the Veneto Region made with cornmeal. Sweet treats like these are meant to bring some cheer to compensate for the sadness of the November 1 and 2 holidays. If the living get closer to the dead on All Souls’ Day, it’s also the time for the dead to get closer to the living. Some believe that the spirits of those departed return to earth on this day. To welcome them, one common Italian tradition was to set an extra place at the table or even put out a tray of food for invisible visitors. This recipe will provide you with the chewy chocolate spice cookie. They are a perfect accompaniment to a cup of espresso or cappuccino. 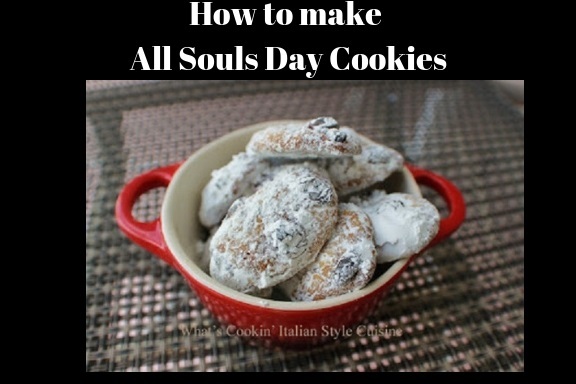 My mom made these all souls day cookies every year, she was from Bari Italy and the way they made them. She was all about keeping traditions going and never missed any Catholic traditional church holiday or foods associated with it. So was grandma. 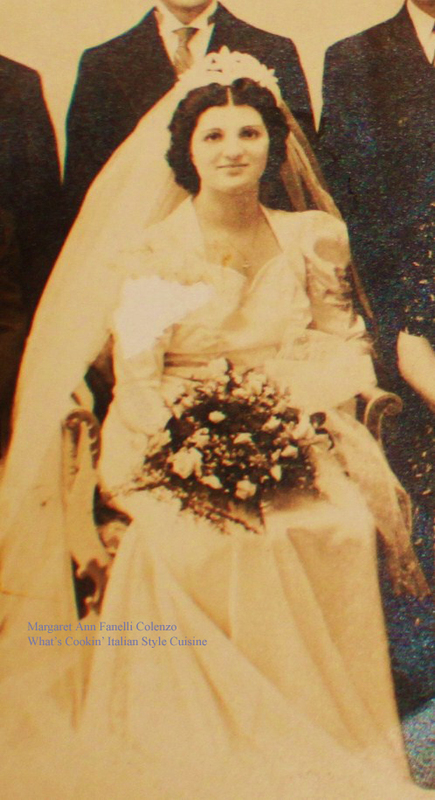 My Grandma Victoria Colenzo was from Rome Italy, very different traditions. I remember her saying they had special flowers and traditions there also. The traditional choice of bloom is bright colored chrysanthemum. The fall flowers are at their peak around All Souls’ Day and Italians associate them with mourning. All Souls Day is from being a sombre affair, for many people the graveside vigil is an occasion to thank their ancestors, a celebration of their lives and a chance for adults and children alike to chat to them as if they were still here. In Rome where Grandma is from, there was even a custom to eat at a picnic graveside. This was a way of sharing a meal with dead loved ones. In other Regions people left lanterns lit and fires burning overnight as their tradition. In Cremona in Lombardy it was customary to get up early on All Souls’ Day and make the bed to allow wandering souls to find rest. In Sicily, those who return bring something with them. Children who’ve been good and remembered dead relatives in their prayers all year long are rewarded with gifts of toys and sweets, sometimes hidden around the house on the morning of November 2nd. In other area's it was customary for the living to give gifts. In Sardinia children go from house to house on All Souls’ Day collecting treats of cakes, nuts and dried fruit in exchange for a prayer for the deceased. "All Saints' Day and All Souls' Day are related, but they are two separate celebrations. "On All Saints' Day there's a call to live as saints, to remind us how we're supposed to live. On All Souls' Day, we're talking about all souls and asking God's mercy for them. We're talking about those people who have died before us, and their process of getting to heaven, through Christ." Sometimes I changed them up! As time went on I would improvise and top these cookies with raisins, coconut and still make the traditional style. 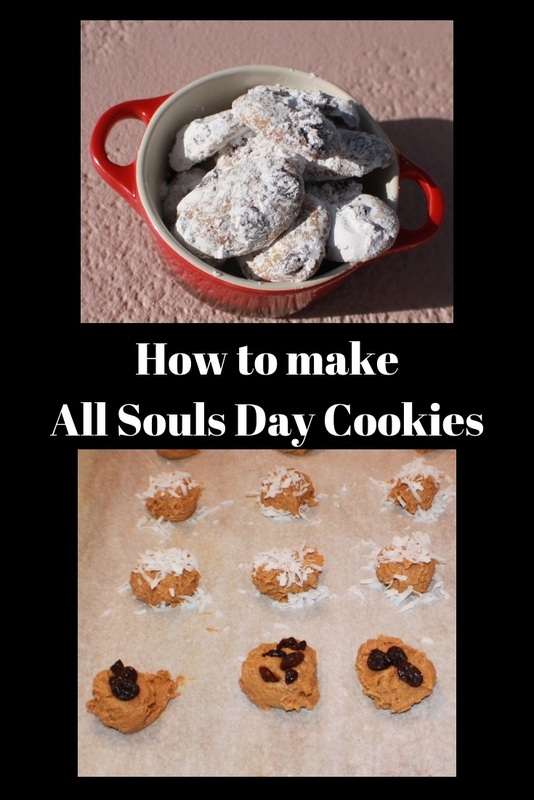 The batter remained the same on these All Souls Day cookies but I would add some ingredients my family liked in them. 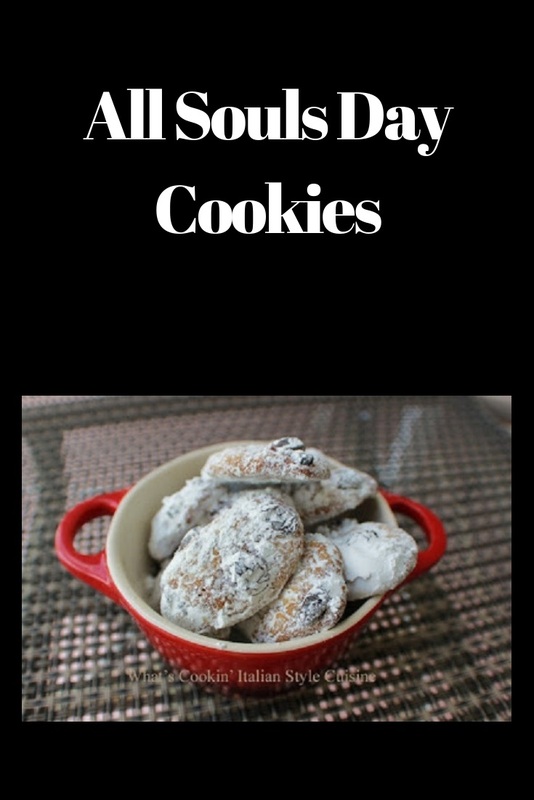 We all love a good chewy spice cookies and these are the perfect All Souls Day Cookies. Even if you don't celebrate All Souls Day or are Catholic, these chewy spice cookies are wonderful. A great little easy recipe to try and great with a good cup of coffee or in our home, espresso coffee. You don't have to be Catholic or carry on tradition of Italy, to eat these delicious day of the dead cookie treats no matter where you live they're a great cookie. Heat oven to 350 degrees. You will need 2 parchment lined cookie sheets set aside. In a large bowl combine all wet ingredients and mix together. Add the dry ingredients and stir the raisins and walnuts in last. Shape the cookies into 2 inch logs and place on baking sheets. Slightly flatten the logs, placing two inches apart, I add a few more raisins to the sides and top if not enough. Bake for 12 minutes on 350 degrees. When completely cooled, place the powdered sugar in a zip lock bag and shake the cookies gently into the sugar. You can freeze these up to 6 months and they are also a sturdy cookies for mailing during the holiday season. There has to be a flavor party in these cookies with cocoa, orange, honey, etc. I may just have to give these a try. I like all of the flavors in this cookie, and they seem easy to make. Have to add these to the list. With walnuts, raisins and spices, these cookies for sure taste great! Nice, I dont know if I had come across the cookies before, but they surely look and sound great. 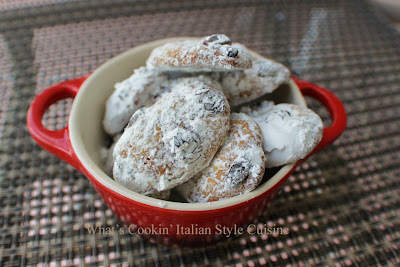 I'm neither Italian (though I kind of wish I were) or Catholic, but these cookies look awesome! Wait. Purgatory before heaven? Is that mandatory? Everyone has to go through that? Is death like getting in line at the DMV? I'm gonna need some cookies. These biscuits sound delicious and I love the old photo of you mum! I love the combination of fruit and spice in cookies! These sound delicious! What a lovely recipe and great memories, the picture of your mom is a treasure. No doubt that our catholic traditions unite us all. Blessings amiga! Never knew there were cookies for all souls day. These sound so tasty! Italians do follow the church's tradition and All Souls Day is a big day in Italy. My mamma would relate how all of their friends and family would get together for a huge picnic. Special foods and desserts were always a must. Your cookies really look delicious and I love the story behind them. Well, I am Ukrainian...and was raised in a Catholic household. Interesting story behind the cookies. I do like the sound of the spices happening here. Sounds like the perfect addition to my afternoon latte. Chewy cookies are my favorite kind! The spices in this cookie sound like they'd be perfect with a hot cup of tea. Can't wait to try your mom's recipe. wonderful combination of flavors. I didn't know these cookies and it looks like a rich decadent cookies. Your mom looks sooo beautiful. This is a precious post and the recipe is mind blowing! I love soft chewy cookies. My grand mom use to make day of the dead cookies. I've never made them myself. Can't wait to try these. Mmm I like these cookies. This is a really unique recipe. Your mother is incredible, and now thanks to her we have a great recipe. This is a really unique recipe! It's so cute to use the recipes of their parents. It is so important to adhere to the traditions. I'm sure that the recipe of your mother is very tasty. I think it's worth a try. I think it is such a beautiful tradition, my husband is Italian so I was introduced to all of his family traditions over the years and now we try to do them ourselves <3 These cookies really are as special as you say, we love the spice to them but the nuts give a nice light texture to the dough itself, all in all it is a delicious way to remember. This looks like more than just a recipe to me - definitely more like a tradition. Quite a great one to save - thank you so much! What a great tradition to keep passed through the generations. These look perfect to pair with a cup of espresso or a rich tea. I really like how you incorporated tradition and memories into these cookies. I love the story and the recipe. What a lovely way to keep memory of a dear person alive.